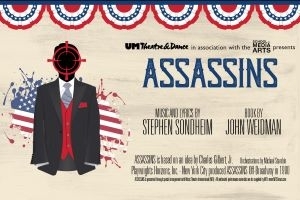 The nine individuals who attempted to assassinate our nation’s presidents—successful or otherwise—are portrayed with passion and pathos in Sondheim’s seminal musical, the winner of multiple Tony awards. Set against the backdrop of a twisted metaphysical carnival game with the prize being the American Dream itself, Assassins forces us to confront our culture (or cult?) of celebrity and the sometimes violent means though which it is pursued.